SINTRA, PORTUGAL: Sintra is only 25 km from Lisbon and a historically significant town of Portugal. The whole town is listed as UNESCO World Heritage Site for its cultural significance and outstanding natural beauty. 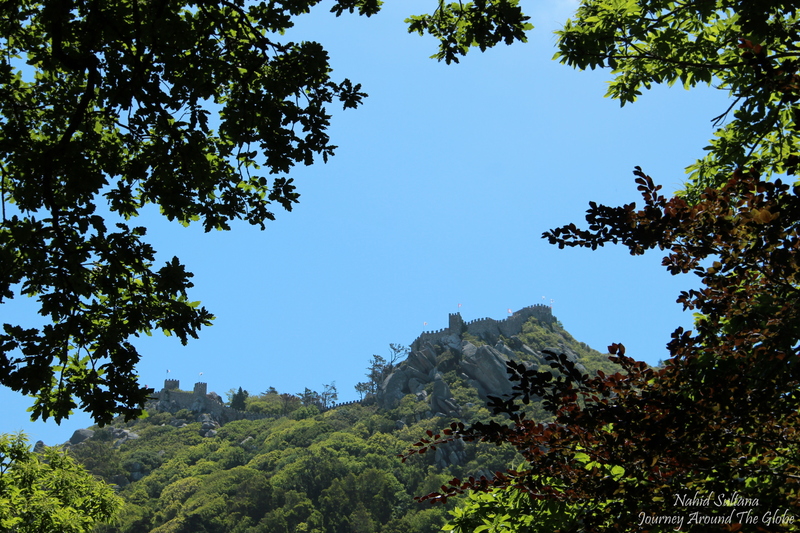 The majestic Sintra Mountains and scattered palaces on hills put a mysterious veil over this town. There are total 4 palaces, and 1 castle in Sintra, among which Moorish Castle and Pena Palace are the most notable and visited ones. Coming to Sintra using public transportation is not recommended because they won’t take you to the castles on the mountains and walking can be very hard too. You can drive there if you have your own transportation but finding it may be a bit hard. We booked this tour to Sintra through our hotel in Lisbon. The tour company’s name is “Mr. Friend” (telephone # 218954083 and website is www.mrfriend.pt). We were charged 58 euros per adult excluding my 3 years old. I was thinking of more like a big bus with a big group that will take us to Sintra. But a small van showed up in front of our hotel at 9 am sharp. There was only another young enthusiastic couple (from Belgrade, Serbia) with us in this tour making it more like a semi-private tour. It was cozy and good thing was we had some flexibilities unlike usual tour companies where you go with a big group and you have no option where to eat, when to eat, and etc. TIME of TRAVEL: We flew to Lisbon in mid-June 2013 when my little sister was visiting us from Virginia, USA. The weather was extremely favorable the day we took Sintra trip. It was a perfect summer day to spend outdoors and by the beach; it wasn’t hot, but very pleasant. OUR HOTEL: We stayed in Hotel DAH (Dom Afonso Henrique) in Lisbon. It’s not in the city center, but very close to metro station that takes you right there in a short time. We had free Wi-Fi in the room and nice breakfast on the roof terrace every morning. There was also a great Italian restaurant “Pepe & Oliva” only one block away from the hotel where we ended up having 3 dinners in a row…yummy food for a very low price. EATING and SHOPPING: When our tour guide asked us where we wanted to have lunch: center of Sintra or Cascais, which is a beach town…we chose Cascais without pausing for a second. Seriously, thank God we made that choice. 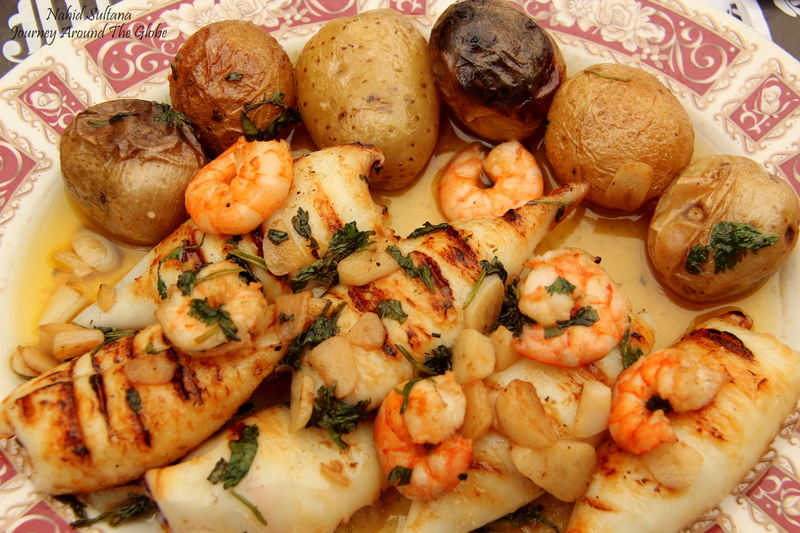 There are plenty of restaurants in the center of Cascais that serve some of the best seafood dishes you’ve ever had. We picked “John Bull”…about a block away from the beach and very close to the center. As I mentioned in my previous post on Lisbon, that Portugal is known for its seafood feasts, especially sardines. But after having sardine in Lisbon, I was up for another fish items. So my sister and I ordered salmon and grilled squid with shrimps (2 separate dishes) with potatoes and some veges. Man, that squid was the best squid I had in my whole life…I can still feel that chewy delight in my mouth every now and then. The price for these dishes in Sintra, as well as in Lisbon, are very reasonable. Cork made items, like post cards, bottles, are very popular in whole Portugal. Also, Portuguese think roosters bring good luck…so, you will find them everywhere too. There are many souvenir shops in Cascais center. 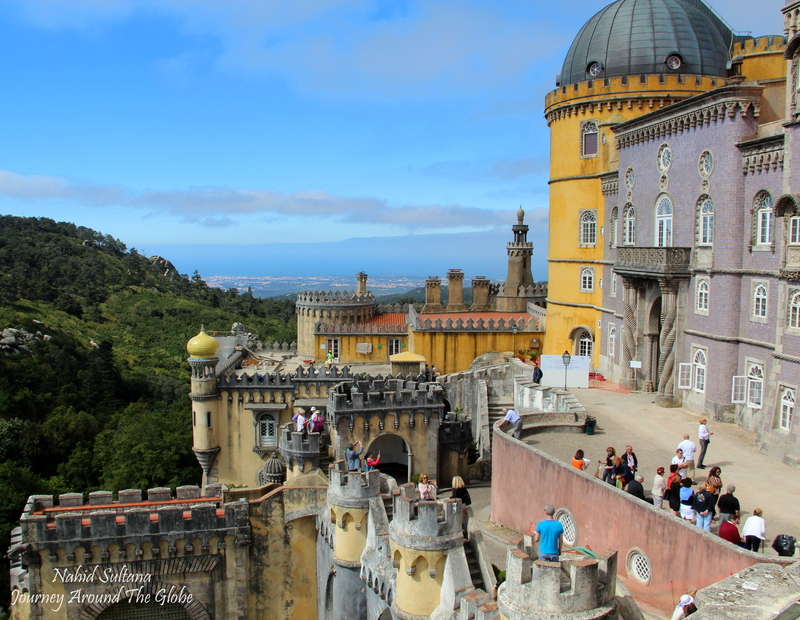 PLACES WE’VE VISITED: Sintra city center is a place which we passed by but didn’t stop. 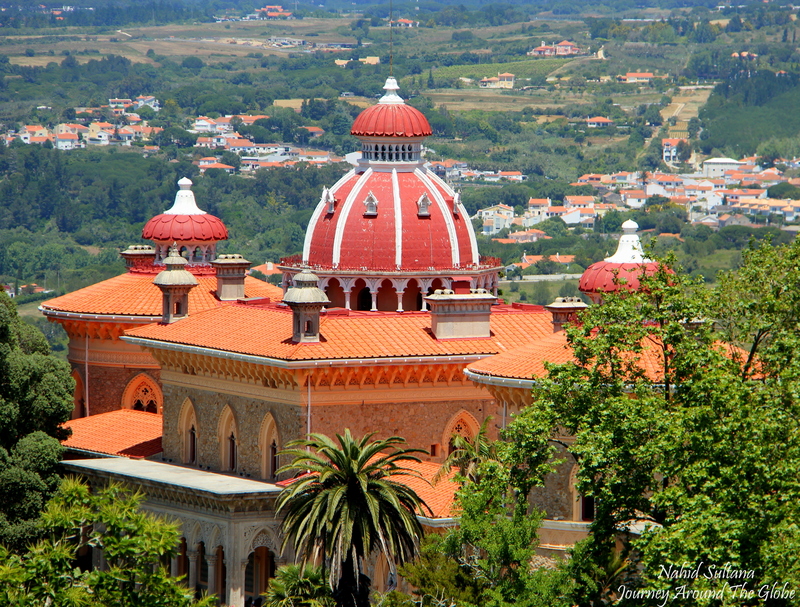 Sintra National Palace, a former royal palace with captivating architecture, is probably the main attraction here. Also look for “Hotel Lawrence” in Sintra which is almost 250 years old making it the oldest active hotel in Europe. 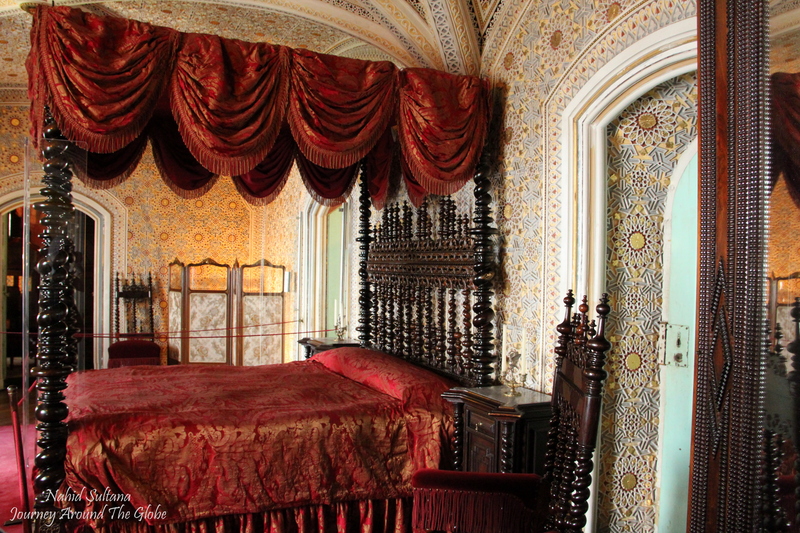 1) PENA PALACE: This was the first stop of our day-trip and probably one of the most romantic palaces I’ve seen so far. Sintra Hills and Pena Palace were listed as UNESCO World Heritage Site in 1995. The Park and Palace of Pena are the finest examples of 19th century Portuguese Romanticism and the integration of natural and architectural heritage. It is considered as the most important part of Cultural Landscape of Sintra. This is a quintessentially romantic palace filled with art works and souvenirs of royalty. 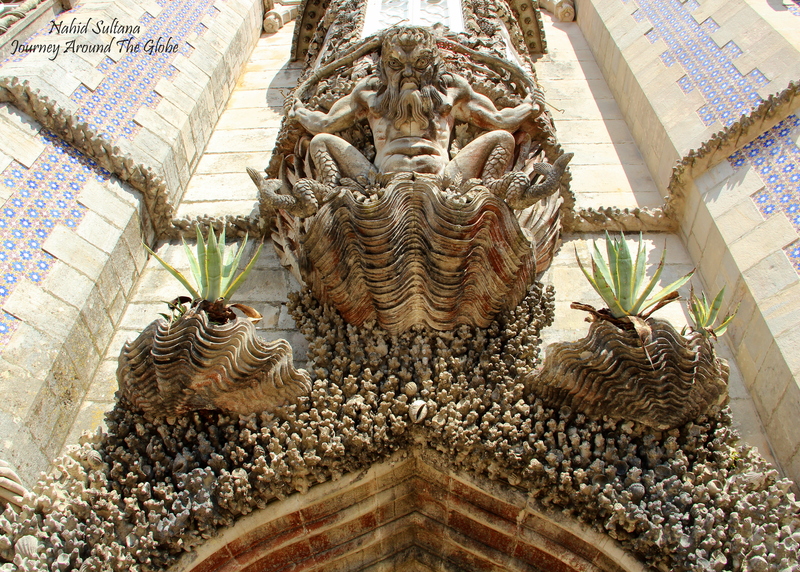 Main façade of the castle is decorated with geometric patterned Moorish-style tiles and the main allegorical gateway has an image of Triton with half-man and half-fish figure. Dominating watch towers were built in various shapes, sizes, and colors making it look like a Disney fairy-tale castle. The minaret of turret has a Moorish dome giving the whole place an Arab/Middle-Eastern touch. The whole architecture and its nearby hills can be best observed and appreciated from Queen’s Terrace. The chapel here is probably the oldest foundation of this place dating back to the 12th century. We had about little more than 2 hours for Pena Palace and could have used little more time enjoying its extraordinary beautiful landscape and surroundings. It is 13.50 euros per adult and 11 for children under 18 years of age. The park is open from 9:30 am – 8 pm but the palace is open from 9:45 am – 7 pm (last admission 45 minutes before closing time). This admission fees to Pena Palace was included with the tour price so the driver/guide got us the tickets beating the queue which was building up as we got there. 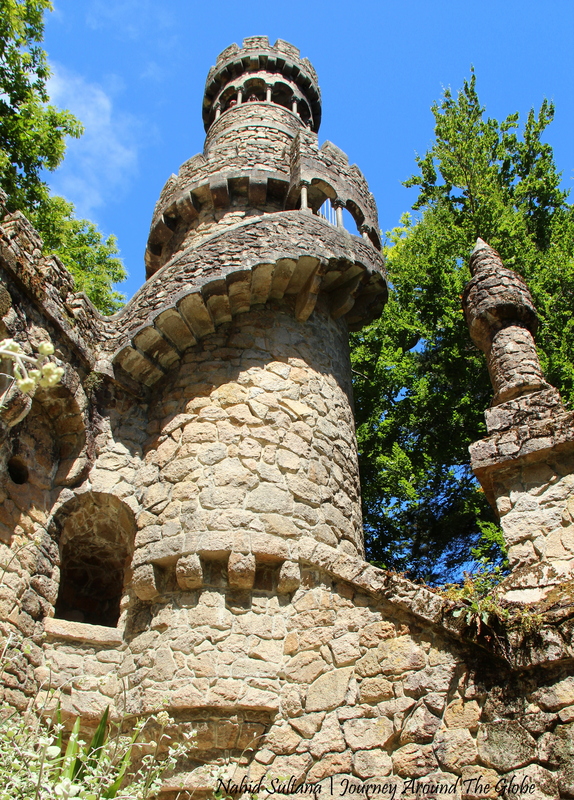 2) QUINTA da REGALEIRA: By far, this is one of the best gardens I’ve visited in my little life. Quinta da Regaleira is considered as one of the most surprising and enigmatic landscape and a high point of Romantic Sintra. The garden is a magical and a mysterious place. Historically, Quinta da Regaleira was the summer residence of Carvalho Monteiro family and was built in the neo-Manueline style. Portugal’s some of best artists were involved designing the palace and garden here. Among them, Luigi Manini is the most notable architect, painter, and designer who devoted 14 years of his life designing its park and palace. My favorite spot in the garden was the “Initiatic Well”. It’s a subterranean tower that sinks some 27 meters into the earth. 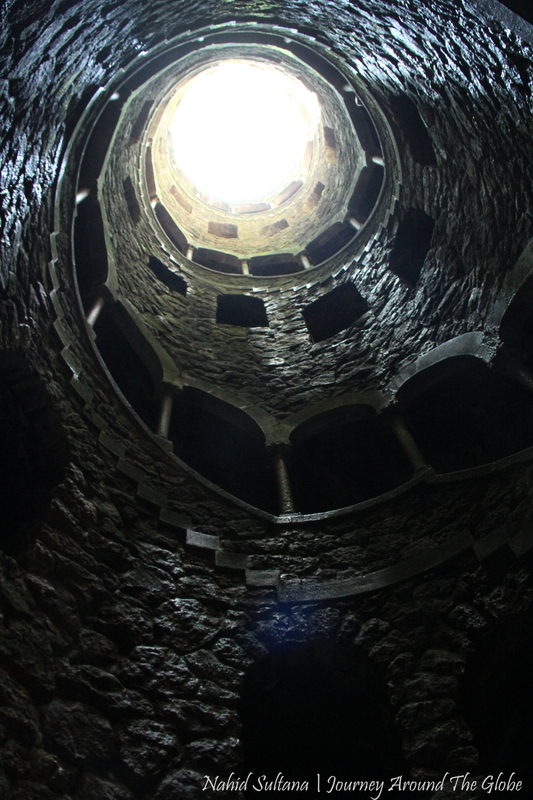 Bottom of the tower is accessible by a monumental spiral stairway – a hallowed space with full of esoteric and alchemical look. This was built with local granites and symbolizes a bridge between earth and heaven. We went to the bottom of the tower, then followed a dark/wet underground tunnel to the outside garden again. It’s an exhilarating feeling being in this tower and not knowing where the underground walkway will take you to. “Regaleira Tower” is another little mind-boggling place where my sister and 7-years old daughter climbed up. The garden has countless mystical monuments like these all around…you just need time and lots of energy to explore its exotic secrets. We were given about hour and half for this garden which was absolutely not enough. We left the garden without visiting “Promenade of the Gods” – supposed to be a beautiful avenue with statues of classical gods. If you don’t have time restriction you can easily spend couple hours getting lost in this huge grotto of secretes. You can take a self-guided tour with a map or take a guided visit during the opening hours. The park is open from 10am – 5:30 during winter and 10am – 8 pm in summer. Entry fee is 6 euros anyone over 18 years old and free below 9 years of age. 3) CABO da ROCA: Cabo da Roca is the western most point in the continent of Europe. 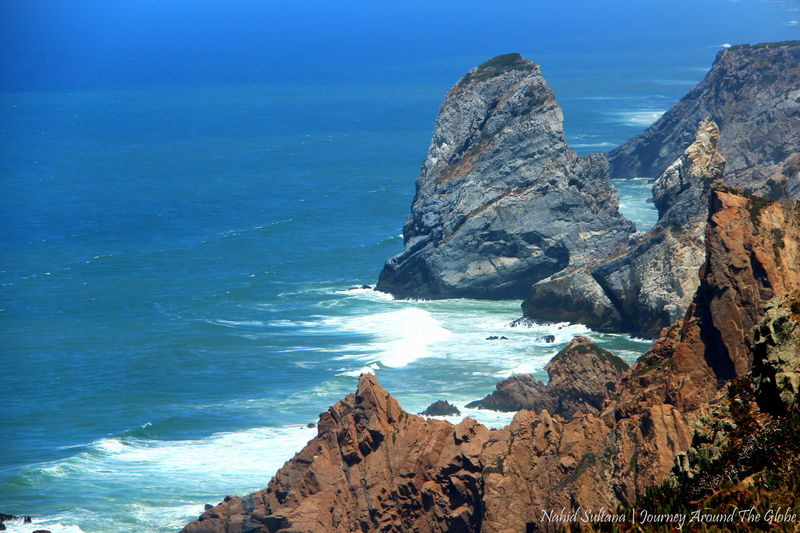 The drive from Sintra to Cabo da Roca was by the beautiful coastline…simply breathtaking. This is a nice little viewpoint from where you can see the Atlantic. The area is a grassy hill with some walking trails, a nice lighthouse, a big cross, and small villages on the mountains in distance. Our guide was saying about 7000 km straight across from that point is Washington D.C. It was so darn windy that we took some photos (none of them were our own pictures though, wind was blowing us away) and went right back into the van. 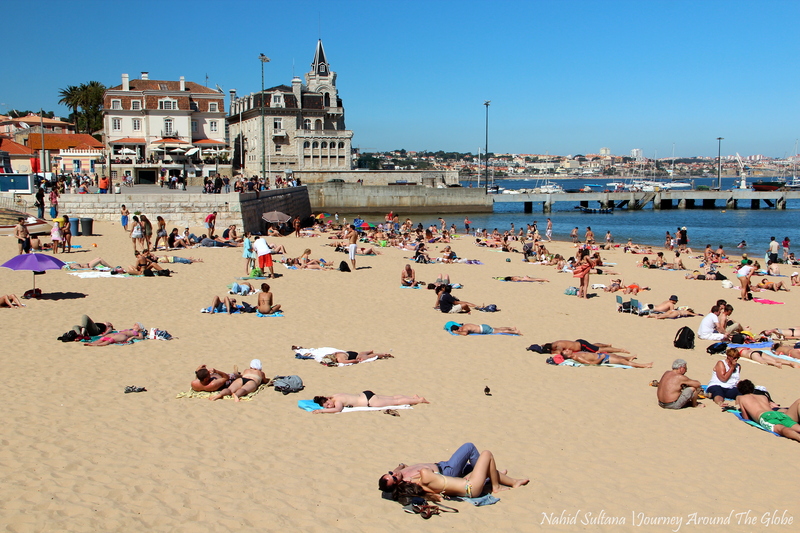 4) CASCAIS: Cascais was a lively little beach town on the Estoril Coast which is also part of Lisbon Coast. It’s very touristic but has a wonderful “Portuguese” charm. The short drive from Cabo da Roca to Cascais was mind-blowing. We reached Cascais late in the afternoon. We took our guide’s advice; the Serbian couple and us, decided to have lunch in Cascais (and not in the center of Sintra). It was a late lunch but thank god we picked this option. There were no restrictions once we reached Cascais as where to eat and what to eat. The Serbian couple went on their own and we started walking towards the main center where all the restaurants were. 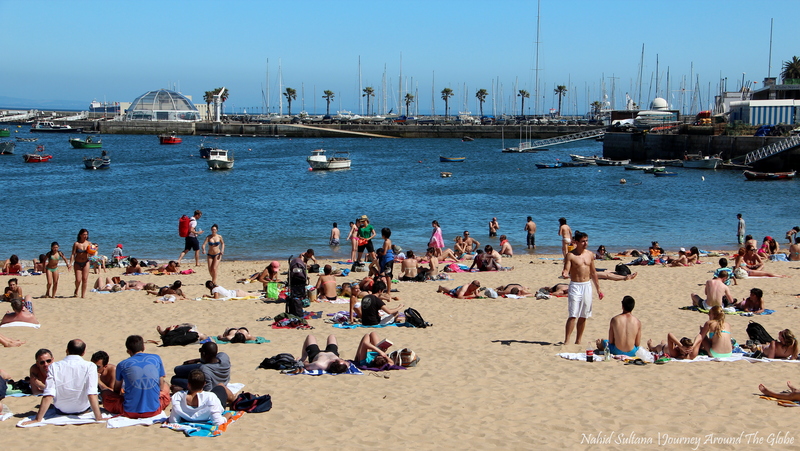 As I said, Cascais is an energetic beach town very close to Lisbon. We weren’t prepared but the other couple actually brought their trunks and swimming suits and took a dip into the ocean after lunch. But walking around its center area and looking at vibrant colored buildings and squares were fascinating. Some tourists stay here overnight or more to enjoy the ocean and its surroundings villages (wish we could do that too). There are many beautiful coastal spots not too far from city center to explore and relax. But for us, Cascais was a nice ending of that day and our tour to Sintra. Nothing beats gazing at the majestic blue ocean on a late afternoon and enjoying some family moments. 5) ESTORIL CASINO: This was our last stop but it was only for 2 minutes just to take a group picture in front of the casino. This is the 2nd largest casino in Europe, after Grand Monte Carlo in Monaco. 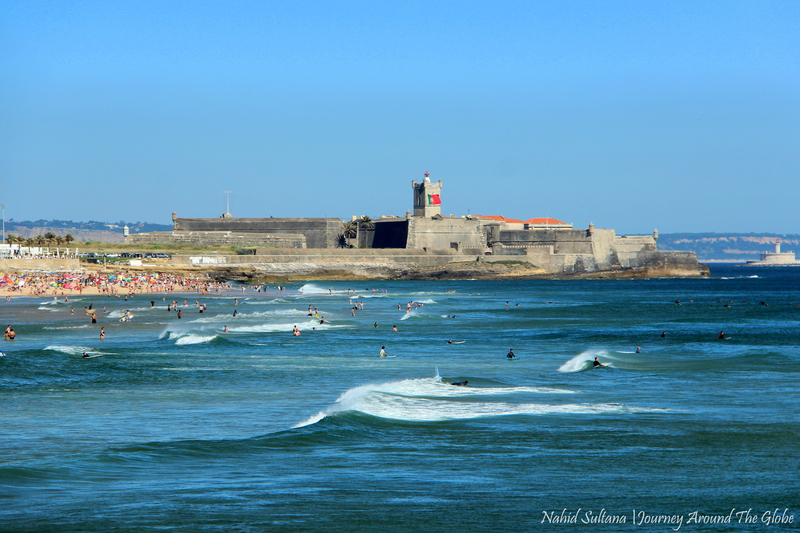 It was only 10 minutes of drive from Cascais. Again most of the drive by Estoril Coast to Lisbon was very scenic. We reached hotel around 6 pm, barely had some so-called “dinner”, and went straight to bed while it was still light outside…what could we do, had to catch an early morning flight back to Brussels. Bye bye Lisbon…obrigado Portugal.